I'm not talking about the Bo Jackson's (football/baseball), the Deion Sanders' (football/baseball) or even the Michael Jordan's (basketball/baseball - although his skill in basketball FAR exceeded his talents in baseball) of the professional sports world, I'm talking about the likes of Joe Gibbs, Troy Aikman (Hall of Fame Racing), and Brad Daugherty - those that have gone from "ball and stick" sports to motor sports. You can now add Randy Moss to that list. Yes, Randy Moss. Randy formed Moss Motorsports, which will compete in the NASCAR Craftsman Truck Series. Other than being a racing fan, Randy doesn't have much experience in the auto racing world, so it will be interesting to see how his competitiveness on the football field translates to the track. As someone that played soccer, basketball and baseball all of his life, working on cars for much of it, in addition to going to school for an engineering degree and now working in the automotive field, this is always something that intrigues me. The two realms are so very different, so it's always interesting to me to see how people that make this shift make it a successful one. Can you do it based solely on your experience at a professional level even if it is a different sport? Or is the quote from Ernest Hemingway I once read have some truth to it? "Auto racing, bull fighting, and mountain climbing are the only real sports...all others are just games." Is winning at a high level a core competency, no matter what the field, court, or track? Not many people have pulled it off with great success. One thing is for sure, I don't know that anyone will ever be as successful in making the shift (back and forth a couple times for that matter) as Joe Gibbs. Although maybe Randy Moss has a shot at it if he can win every race, INCLUDING that last one of the season! Yes, I'm still a little upset by the Pats losing the Super Bowl! Such a shame for ANYONE to go that far and not get the job done. Not to say that Randy Moss and others haven't closely examined their investments of time, money and skill to be sure the new "arena" they're entering is within their core competency, but I cannot say enough that this is something we will be constantly doing on our quest for the "perfect season". Ford Rumored to Release a Production Baja 1000 Truck! When you read the title of this post, were you expecting this...? Simply stated, the F-150 Raptor doesn't do it for me. I'm sure a lot of truck and particularly off-road truck enthusiasts feel the same way, as corroborated by the many bloggers out there. Sure, it looks to have a raised suspension and tires with a lot of sidewall, but stylistically, it's still a boring old F-150. Give me something more...especially if you're going to badge it with a name like "Raptor". Nothing about this truck seems ferocious like a Raptor, at least from a design stand point. However, looking at the proposed engine, the anticipation of using the 380 hp/400ftlb BOSS engine does make the vehicle somewhat more interesting, but it would still need some aftermarket mods to really get my off road juices flowing. 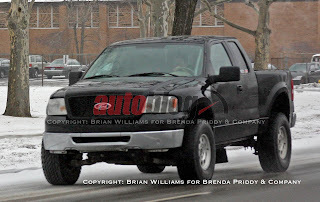 Seeing this truck going down the road (if you notice it as something different at all) only inspires thoughts of yet another stock F-150 that someone purchased a simple lift kit for and maybe some aftermarket wheels/tires which has been done hundreds of thousands of times. Ford is calling this truck the "first and only Baja 1000 Trophy Truck available from a dealer." It may be the first, but as far as the "only" [Baja 1000 Trophy] truck available from a dealer, that's where the LM design community and the fresh, exciting designs it is generating comes in. Stay tuned to see if LM will join the ranks of the Raptor! Today's docket centered around functionality and how to get the most of it out of our existing resources. First, I put the finishing touches on a revised version of the LM logo. Instead of sending the file to a supplier to have the part made, then chromed (it's the size of a hood ornament or rear badge), I printed a couple samples on our 3D printer. Once finished, I'll still have to send them out for chroming, but I was able to utilize the printer's functionality to save the time and cost of having a sample outsourced. On a deeper level, I was also able to use a new function the printer allows us - the ability to make fixtures to hold fragile parts...all with the single click of the mouse! Once the file was loaded into the printer software, all I had to do was select the fixture option and it printed a fixture and the part simultaneously. This makes removing the fragile part easier and I can also use it to hold the part when I send it to be chromed. We also received our two roll-away tool chests today and have them in position, ready for work. What's functional about the tool chests is more than just their ability to hold tools. We purchased two rather than one roll-away and one top box so that we can use the tops as work surfaces, giving us portability, and better use of space. Look for this use of functionality in the LM models we'll be building with the aforementioned tools and many more! The Scuderi Group and their split cycle engine (previously mentioned in my March 12th post) are in the news again gaining steam and notoriety amongst industry professionals. 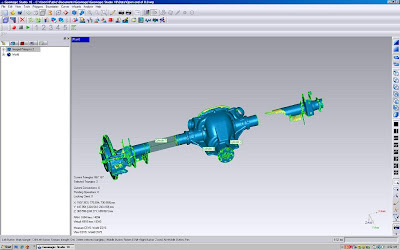 An article on airhybridblog.com details Day One at the SAE World Congress, specifically the finding of independent testing of the engine shows that the Scuderi engine "exceeded expectations around engine efficiency, power and NOx emissions." From the tone of the article, it sounds that the Scuderi engine was a main attraction at the show for all facets of the automotive industry. As we continue to research our engine of choice as well as alternative power plants for future vehicles, we will certainly keep our eye on Scuderi and be sure to keep you updated with our findings. I read an article today on the AutoWeek website that detailed the predictions of a panel of auto execs at the SAE World Congress that Diesel engines will have a 20% market share in the U.S. by 2020. I find this estimate to be accurate not only because as a former BorgWarner employee, knowing that the company keeps a close eye on such things (one of the people making the prediction was BorgWarner CEO Tim Manganello), but I also witnessed this at the New York International Auto Show a few weeks ago. Every manufacturer either has a diesel powerplant on the market or plans to offer one within the next year or two - and not just in their trucks or SUV's. It's also interesting to note that they predict that hybrids will have 10% share of the market. This aligns perfectly with our green initiative. We've already chosen to work with a diesel engine for our first vehicle and may use hybrid technology in the near future once the technology has become more refined and less expensive to incorporate to the great designs we're seeing from our community. First, I neglected to site the relevance of the video in my last post, thinking that it was mainstream enough to be understood by all, but it seems that there is a slight generation gap between those that are in the know about the great "Mr. Wizard", Don Herbert. In his show, Mr. Wizard would conduct science experiments in his kitchen with one of the neighborhood kids. The theory behind some of the experiments was actually quite complex, but Mr. Wizard had a great way of turning what one thought to be complicated to very simple to understand, especially to young children since the show was mostly aired on Nickelodeon - at least for my generation (the show aired in the 50's and 60's, made a comeback in Canada in 1971, then aired on Nickelodeon - affectionately known as Nick to those of you growing up in the 80's and 90's)! My favorite part - some of the cool explosions!!! My reason for referencing Mr. Wizard of course was to create an interlude into what I hope to be a similar series of posts that take something that at the core can seem pretty complicated and break it down into something easier to digest in an effort to open the educational channel between the LM team and our community. As for the name of said series, I'm still interested in your feedback on what it should be named. We now have a new utility on our website where you can post your comments about someone's profile right on the profile page at the left under the profile overview. 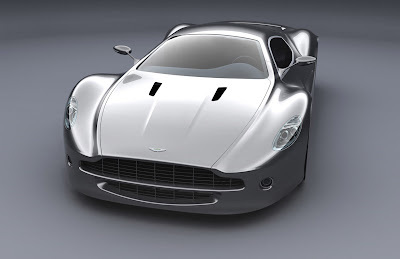 Therefore, I invite you to post your comments on what we should name the series or just any general comments on my profile, the blog, or Local Motors in general. In an effort to cement our cornerstone of shared education (our own and that of our community), I've decided to take the Vehicle Engineering Blog to the next level and begin an educational series. The series will most likely be a weekly entry on anything engineering - it could be specifically how the suspension on the LM vehicle works to how fuel injection works in general to how certain tools are made or how they work and how we use them at LM. I've also decided to add an extra element to the series and extend another linchpin we have here of building a community around the vehicle design to the vehicle blog by taking your thoughts on what I should call the on-going series. Over the next week, post your ideas as comments to this post, or send me an email mpisani@local-motors.com! Instead of continuously finding fault in all that the large auto manufacturers do/don't do, I believe in giving credit when it's due even if it is to a direct competitor. They have to get things right some of the time to stay in business, right? 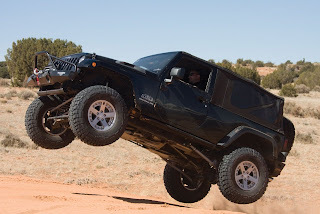 I found such proof in an article about Moab Jeep Safari 2008 in Motorcities.com. In this article, the event the Mopar and the Mopar Underground Performance Team (I like that name - a creative, cooler sounding way to say Research and Development I think!) held in Moab this March was detailed. 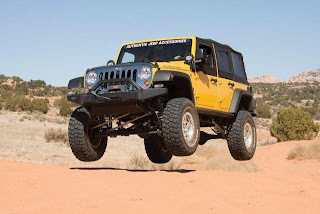 The event was held to put Mopar Performance parts to the most grueling tests and done so in some really cool customized off road Chrysler products, such as those seen below. 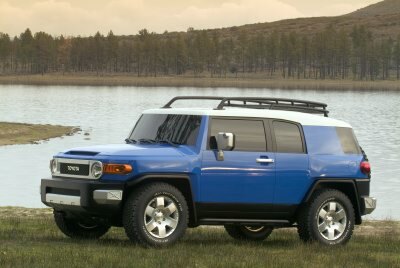 Check out the article for a list of the vehicles used, including some normally pretty timid vehicles they tricked out! This is really inspiring to see, so my hat goes off to the Mopar team for a job well done! Expect to see this type of event and community involvement on a frequent basis from Local Motors. 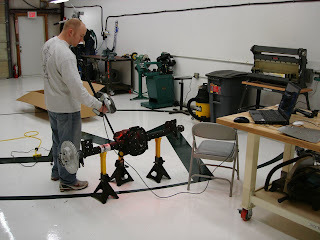 This is the type of stuff Local Motors is all about, so watch out, Mopar! If you haven't seen or heard of the crash NASCAR driver Michael McDowell had during qualifying at Texas Motor Speedway recently, see the video below...it's a pretty nasty crash. However, as you can see, he walks away from the crash basically unscathed. If you listen to the audio, the announcer Larry McReynolds (former Dale Earnhardt Crew Chief) you will hear him mention that the fact that he's able to walk away as he does (and conduct an interview about 20 minutes later!) is argument for the "Car of Tomorrow" which is about 2 1/2" taller and 4" wider - "and all those are great things." I'm not going to make the argument that Dale Earnhardt, and Adam Petty and several others could definitely still be with us today if only they were driving the Car of Tomorrow because there are several other factors involved in crashes such as those, but driving a car that puts the driver closer to the center and is based on a larger footprint like the Car of Tomorrow (the change was based on the larger footprint of the NASCAR Trucks which had shown to withstand serious crashes quite well) plays a very important role in driver safety. This is one case in the point of Local Motors building a vehicle based on a larger footprint, while we are also aiming to be a lightweight, excellent performing, fuel efficient vehicle. One of the core values at Local Motors is education. Education of our staff of how to constantly produce better products, do so more efficiently and then to pass what we've learned on to our customers so they can be educated about the car they're purchasing more than any other manufacturer can. One thing that will help us to educate our customers is a clear description of the parts used to manufacture the car, and how it all goes together. One area of a car where this can get very complicated in a hurry is in the electrical system. Therefore, in my experience, when you are trying to educate a customer on the components of the electrical system and how they all interrelate, having a clear, simple to follow diagram helps a great deal. 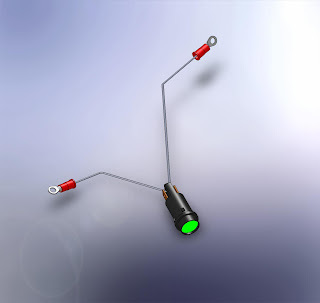 One way that we can simplify the electrical system of our cars is to use a new feature in SolidWorks that allows you to use a library of electrical connectors already loaded into the software (you can also add your own to the library) to create wire looms. 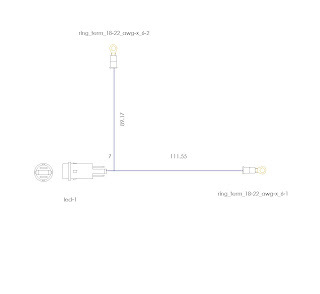 For example, I created a simple display of this capability by loading an LED light and two ring connectors that were in the library, and sketching the wires that connect them. From the picture it's a little hard to tell, but the routing can be done in a 3D space. This works great for routing the harness in the chassis so you can be sure that it's away from heat sources etc. You can also use the pre-loaded library of harness clips to represent how the harness will be fastened to the chassis, under the dash etc. From the 3D model you can automatically create a diagram that's complete with lengths of each wire, connector descriptions and connector end views so if you were to hold the connector in your hand and look at it head on, you could identify the plug. When wiring a car, these connector end view are invaluable as many plugs look similar, but may have a slight difference in pins, color, and wire colors. All of these can be addressed in the connector end view. 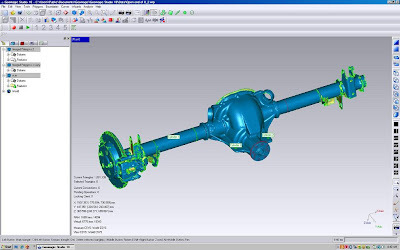 Tools like this will allow for more accurate design and more effective education of our customers - probably two of the most important factors in offering a customer experience like no other auto manufacturer can accomplish. Once again, we had the scanning specialist, Rob from Paperless Parts in the shop for more training today. We continued to learn the scanning software, and also loaded the parts we scanned into the Geomagics software. Once in the Geomagics package, Rob was able to give us some basic training (more formal training is on the schedule in the near future) on how to manipulate the scanned images and get them ready to import into SolidWorks. ...Saving us SEVERAL hours of CAD time to physically measure the part and enter it into SolidWorks. One of the great things about working with Rob has been that he's truly a car guy, as evidenced by his Subaru WRX wagon that he rally crosses and from some stories of his experiences on road and off that he shared with us, which helps us a great deal because he's already thinking in ways we vehicle engineers at LM think, so often times he answers a question just as you're about to ask it. He's also familiar with the types of parts we will be working with, so he was able to give us some hints on how to scan certain parts that we will be scanning in the future. Thanks to Rob and the crew at ZCorp, Paperless Parts and Great Eastern Technology for all of their top notch service up to this point! This equipment/training will allow us to accomplish a great deal of work with minimal effort and still allow us to produce great designs!